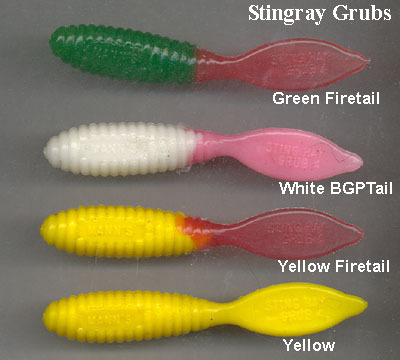 Stingray Grubs: These are probably the oldest and most imitated grub on the market today. They have a myriad of uses. They can be bounced across the bottom to simulate a crustacean, they can be used sink and draw and they are also very popular for tipping off spinner baits. They can also of course be fished weedless. 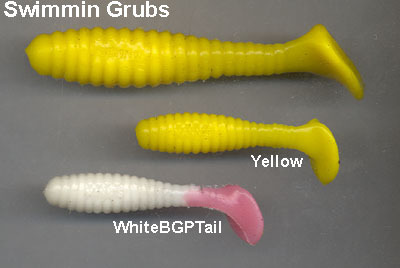 Swimmin Grub: This is a very simple yet effective soft bait. It casts easily, it avoids tangles and is one of the few soft baits that can be used without a jighead if necessary. It has an enticing body wobble as well as a swimming action. We have used it too deadly effect for pollock off the rocks.